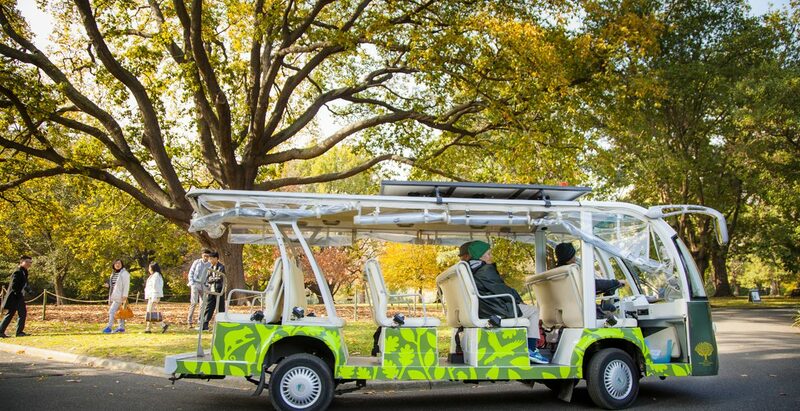 The Garden Explorer is the most convenient way to navigate Melbourne Gardens. This engaging and informative bus tour led by an expert guide provides you with a snapshot of this 38 hectare inner-city haven. Begin your journey on Oak Lawn as your guide takes you through meandering paths to some of the Gardens’ major highlights and most beautiful collections, while providing expert commentary and unbeatable photo opportunities. This 30-minute experience provides a wealth of interesting and engaging content including the history of Melbourne Gardens, its cultural significance and interpretation of landscapes. Complete your ride in a full circuit or hop off at Lakeside for some refreshment at The Terrace, or go on a serene cruise around the picturesque Ornamental Lake in an elegant wooden punt. Royal Botanic Gardens Victoria are a 2019 Friend of the Festival. Mon – Fri, 12pm - 5pm (every 30 mins), Sat, Sun and public holidays, 11am - 5pm (every 30 mins). Tickets are available from the Visitor Centre (cash, EFT or credit card) or from the tour guide (EFT or credit card only) at the departure location.